Proper seasoning and storage provide optimal dimensional stability of lumber in service. To minimize shrinkage, SPIB’s Standard Grading Rules for Southern Pine Lumber require dimension lumber 2″ or less in thickness be kiln-dried or seasoned to a moisture content not exceeding 19%. This will result in an average moisture content of about 15% at the time of manufacture. Additional conditioning will take place when lumber is stored and used as it adjusts to the moisture content of its end-use environment. For interior items, such as flooring, millwork and furniture, the end-use moisture content will average between 6% in the dry Southwestern U.S. and 11% in the humid U.S. Gulf South. For exterior items, such as framing, siding and sheathing, the end-use moisture content will average 12% in most areas of the U.S., with a range from 7% to 14%. Inspect lumber upon delivery for proper grade-marking and moisture content, plus other conditions that may require attention, such as mold. Unload lumber in a dry place – not in wet or muddy areas. Elevate lumber on stringers to prevent absorption of ground moisture and to allow air circulation. Do not store lumber in direct contact with the ground. Cover lumber stored in an open area with a material that will give protection from the elements. 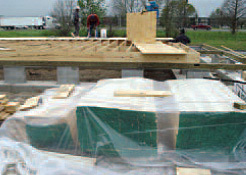 Polyethylene or similar non-porous materials act as a vapor barrier, so it is important to allow ventilation around the material to prevent condensation on the underside of the covering. Enclose framing lumber under roof as soon as possible. Store exterior patterns (e.g. siding, porch flooring) in a covered outdoor area. Store interior items such as flooring, millwork and cabinets in the enclosed conditioned area where installation will occur. There is additional protection when lumber comes in paper-wrapped packages or has been treated with a weather protective coating. However, availability is limited and weather-protective coatings are generally effective for only about three to six months. Damage to the paper during transportation can reduce its effectiveness, and protection is lost when paper wrappings are removed. For additional information, refer to the SFPA publication, Managing Moisture and Mold (download in Publications). Pressure-treated wood is safe and environmentally friendly when properly treated, handled, and installed. Many of the same safety rules for using untreated wood also apply to the safe use of treated wood. Treated lumber should be stacked and stored in the same manner as untreated wood. Refer to the SFPA publication, Pressure-Treated Southern Pine (download in Publications).